I don’t know about you, but when I think of Italy I think of food. Leading up to my weekend in Venice I dreamed about all the food I would eat. My plan was to indulge, and I did a good job accomplishing that goal. To be fair, we didn’t wine and dine in the typical sense. We never sat down at a nice restaurant and struggled to pronounce the names of different pastas. We ate most of our food on the go, but it allowed us to see and try more things. I was honestly stopping every few minutes to consider buying all of the tempting pizza, pastries and pasta along the way. I could write for days about all the food one could try in Venice and the surrounding area, but today I’m keeping it to the essentials. That is broad, I know. Odds are you are safe ordering any kind of seafood in a city that lies directly on the water. I made sure to get shrimp in my pasta as opposed to chicken and made a quick stop at a life-changing “fast food” spot, which I highly recommend. Acqua & Mais made me fall in love with calamari. It was recommended by GQ Magazine yet we happened to stumble across it. Get the most popular option, which contains shrimp, a baby octopus (squid? still unsure) and its mommy’s tentacles. Okay, kind of morbid, but it tasted amazing. This one is obvious but still needs to be listed. Walk around the city shamelessly licking or sit by a canal and watch the gondolas pass by you. Side tip, go where it is crowded. 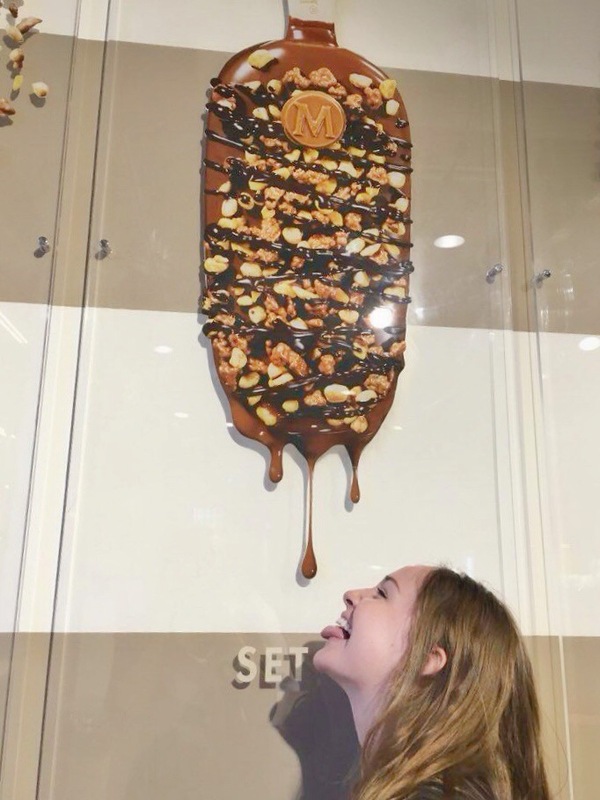 That is usually a good indicator that the gelato is well-known and tasty. The Panini I ate in Treviso was unlike any other Panini I tried. It wasn’t necessarily life-changing like my seafood cone, but it was rather good. Plus it is a local favorite. Our host took us to a small spot that was spilling over with people eating their Paninis and drinking Prosecco for lunchtime. Go with something you wouldn’t normally get. I let our host order for me, and he got me some uncooked meat of sorts, sundried tomatoes and a creamy goat cheese. Don’t be afraid to point and nod your head yes to everything. We accidentally booked our room about 25 minutes outside of Venice in a town called Treviso. It ended up being a good mistake. Treviso is where Tiramisu was first made. We even walked by the place where it was created (sadly, it was closed when we got there). 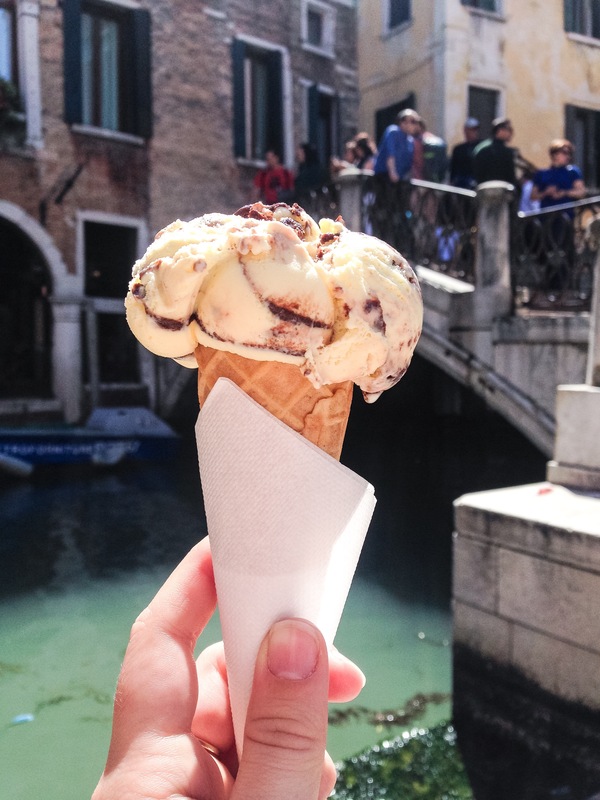 You can either eat the delicious dessert in its hometown of Treviso or nearby in Venice. But do I really have to mention this? We happened upon a hole-in-the-wall kind of place called Friedland. Being hangry at this point, I settled for whatever was close and not going to break the bank. It turned out to be delicious. 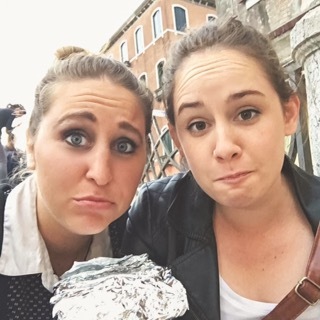 We got our pasta to-go and sat on a bridge watching the people pass us by. Then, to top it off, a sweet old couple came up to us (probably thinking we were poor girls, which maybe we kind of are) and offered us their pizza they couldn’t manage to finish. Who says ‘no’ to free pizza? We didn’t. I am not saying you should give into peer pressure, but if you do not drink Prosecco you will look like an outsider. I’m not exaggerating when I say everyone in Venice (and Treviso) drinks Prosecco. One thing I learned about Italy is that there is no such thing as Italian food. Each region and city has its own specialties (i.e. Treviso is Tiramisu territory). 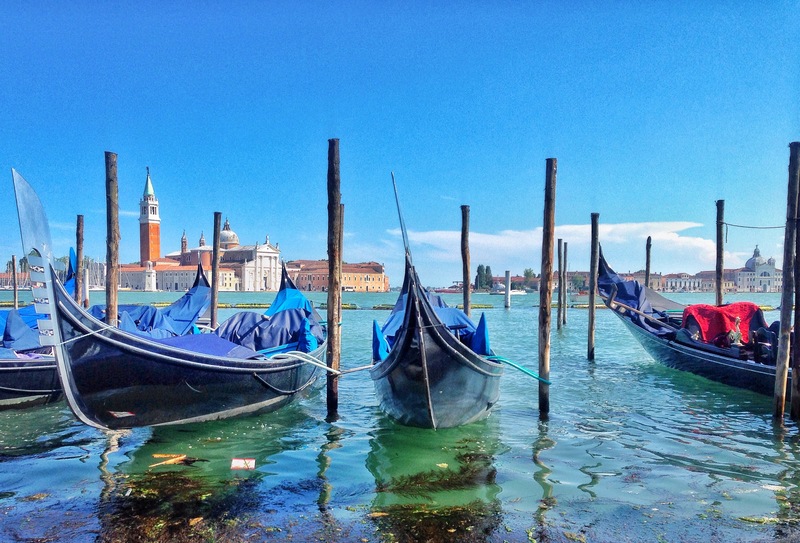 Venice is in the region where Prosecco is made so naturally everyone drinks it there. Join the locals and enjoy a glass. Can you guess what one of the key ingredients in this drink is? Yes, you guessed it. Prosecco! Around 5/6p.m. you will see everyone sitting down at cafes and bars with these orange drinks. It is a tradition here and done by most people. 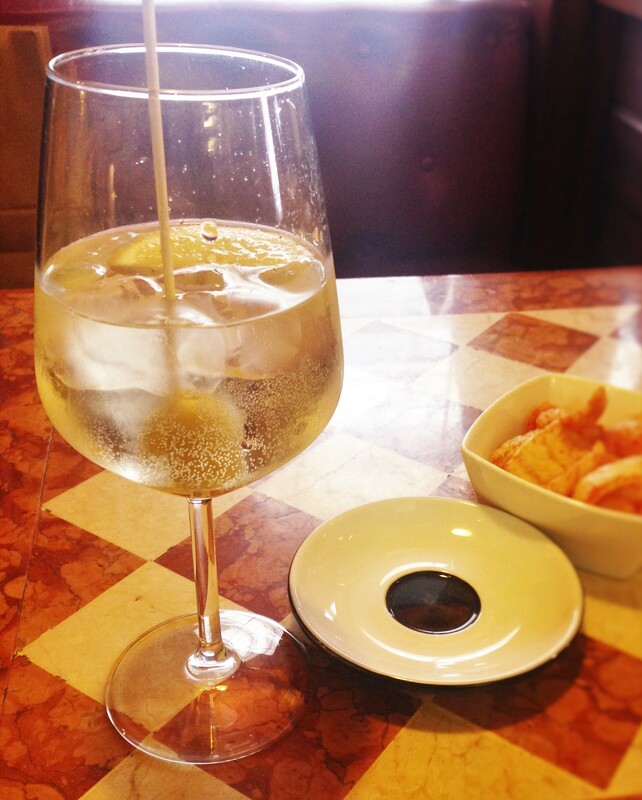 The drink is not strong so it is usually drunk before dinner at aperitif hour (Italy’s version of happy hour). Except it’s done in a much classier way and used to come together as a community. Do not fool yourself. This is no ordinary hot chocolate. My first encounter with Italian hot chocolate was at an Italian restaurant in Munich, and I knew I needed to try it in its homeland. Hot chocolate here is not the watery light brown drink we have in the States. Italian hot chocolate tastes and looks like someone melted a chocolate bar into a cup. Apologies that I cannot show you a picture of the one I had in Treviso. I sipped it down before even considering a photo. But take my word for it: you need it in your life. No matter what you eat here it will be tasty and fill your dreams for weeks to come. My final recommendation: if you want it go for it.